We are a member of Amicus, a cooperative of the finest independent solar companies across the United States. 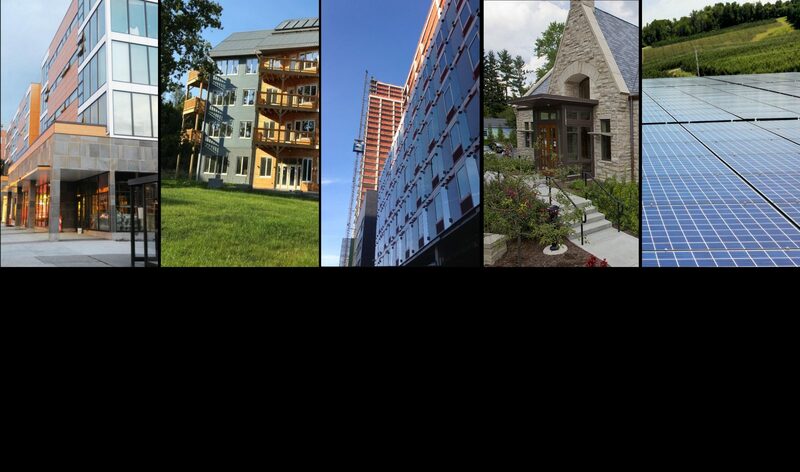 This month, we asked Amicus members about their involvement with Solarize programs and similar community focused efforts. How well does community outreach increase solar energy awareness in their regions? With the help of Solar Energy International (SEI), the Solarize program was able to make its way to the North Fork Valley in Western Colorado this past year. Unlike the adjacent Roaring Fork Valley, which has seen an increasing stream of both residential and commercial PV systems due to solar friendly policies and incentives, the North Fork Valley has remained relatively solar-free. This is not entirely surprising, as the North Fork Valley has a long coal mining history which has informed much of the culture in that area to this day. Due to this history in addition to the adverse economic climate, many were unsure of how successful the program would be. Kristen O’Brien, an AmeriCorps VISTA at SEI, organized and implemented the Solarize North Fork Valley program. Local companies Empowered Energy Systems, LLC and Sunsense Solar partnered together to act as the installers for all of the new PV systems. Once the program was announced to the community, there was overwhelming interest from residents in the area. In the end, this program spurred $400,000 worth of investments in over 125kW of PV. In addition, this program created 3 new jobs in the area. Kristen was even awarded the Colorado Governor’s Service Award for Outstanding AmeriCorps VISTA for her hard work and success. After seeing the amount of interest, the new SEI AmeriCoprs VISTA, Gerald Espinosa, plans on beginning phase two. This will potentially involve a community solar garden model. Gerald envisions that solar will be a source of economic revitalization in the North Fork Valley and will hopefully transform the current coal economy to a green economy—similar to the nearby Roaring Fork Valley. Solarize North Fork Valley proves that this grassroots program has the potential to be successful in even the most unexpected places. ReVision Energy has had the honor to manage several Solarize programs across a broad geographic range over the last few years. Our first was Solarize Kearsarge, where we partnered with Vital Communities to install solar on 38 homes in the towns of Andover, New London, and Wilmot, New Hampshire. Solarize Kearsarge largely came together because of an incredible team of volunteers who helped organize things like rallies and other events in their community. A special thanks goes to Larry Chase of Andover of Bill Spear of New London. In Maine, our first campaign was the community-organized Solarize Sacopee, which was a direct partnership between ReVision Energy and the Ossipee Towns for Sustainability. Rather than many models where installers compete in an RFP process, we worked directly with the nonprofit to coordinate launch of a website, intake of interested homeowners/businesses, community events, press, etc. We worked on a similar arrangement for Solarize Central Lincoln County which closes on November 30, 2015. Also ending November 30th is SolarUp Chester-Derry, a campaign similar to the Solarize model but rolled out for specific New Hampshire communities. Finally, we are in the height of Solarize Brunswick for Brunswick, Maine. Solarize Brunswick is a more traditional Solarize program, where the town produced a competitive RFP and ReVision Energy was selected by a town committee after a thorough review process. We are extremely excited to partner with the town of Brunswick, which has been an incredibly important community for ReVision Energy since the earliest days of our company. As of this writing, we have entered into the third discount tier and are well on track to reach the highest discount tier before the campaign ends in January. The factor most likely to inspire someone to go solar is to see their neighbor do it, and these Solarize campaigns are extremely effective at building buzz in a community. While we strive to offer incredible support and competitive pricing to every customer on a daily basis, seeing communities band together to support solar is incredibly exciting and shows all the positive energy associated with the solar industry. We hope to see this energy and enthusiasm continue into 2016 and beyond! Taitem was new to Solarize programs before last year. For those that don’t know about these community based campaigns, a Solarize program is a locally focused initiative intended to educate homeowners and businesses about the benefits of solar energy while bringing in qualified solar companies to provide design and installation services below market rates. The first Solarize program occurred in Portland, Oregon starting in 2009 and carried on through 2012. 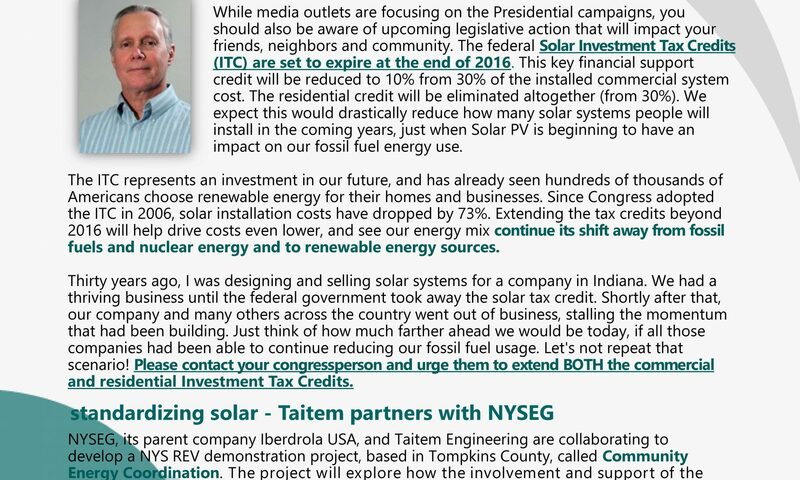 In May 2014, Taitem joined Solar Tompkins based here in Tompkins County, New York. Solar Tompkins was actually a follow on program to a smaller effort carried out the previous year. In the 2014 Solar Tompkins initiative there were three installer partners selected as service providers for the county wide program which encompassed about 500 square miles and 100,000 people. This multi-installer setup was a first for Solarize programs and worked out very well. It provided clients with pre-qualified vendors, and freedom of choice so people could select a company and product set that fit their preferences. 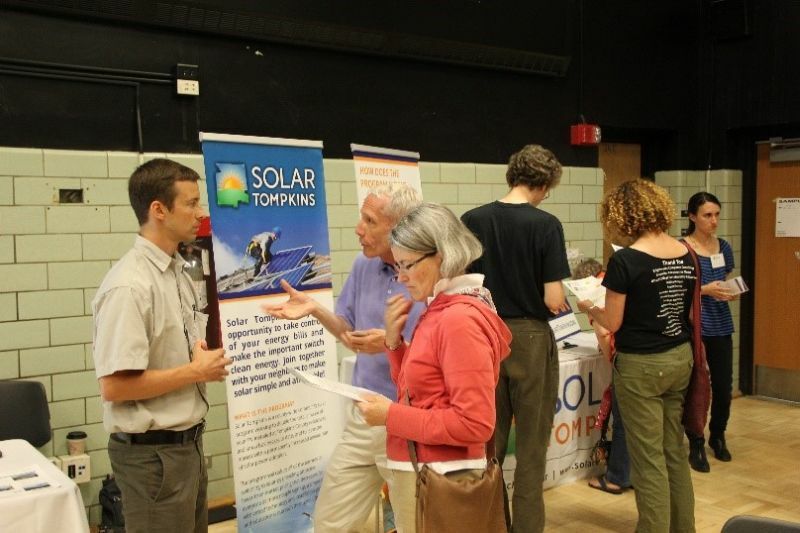 Solar Tompkins comprised 60 events throughout Tompkins County. Quite an effort! These events were community focused meetings that allowed program enrollees to learn about the fundamentals of solar energy and financial incentives from the non-profit event organizer – in this case a group called “Solar Tompkins” – and also meet the three installers for some Q&A. Together we signed up 400 projects totaling over 3 Megawatts of solar PV systems during the seven month long program. Solar Tompkins inspired many of those involved such as the volunteers that organized events, the community members eager to empower Tompkins County, and the installer partners like Taitem that met with hundreds of families, non-profits, and businesses interested in solar energy. The success of Solar Tompkins encouraged neighboring counties to carry the solar torch into their town halls, and in 2015 we have seen similar programs continue where Solar Tompkins left off. Taitem is currently involved with four Solarize programs: Solar Schuyler, Solar Seneca, Go Solar! Southern Tier Central, and Southern Tier Solar Works. New York State has TWENTY active Solarize programs which are twenty reasons why we have strong growth in renewable energy production. For New York, Solarize programs work! 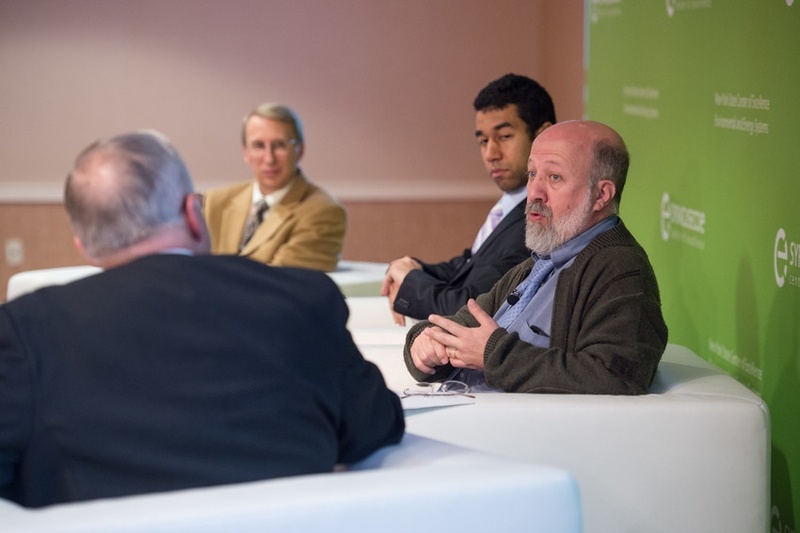 What developments of the last 30 years have changed the building energy field? What developments in the next 30 will transform it further? These were questions posed of the closing panel at the 15th annual symposium at the Syracuse Center of Excellence (CoE). 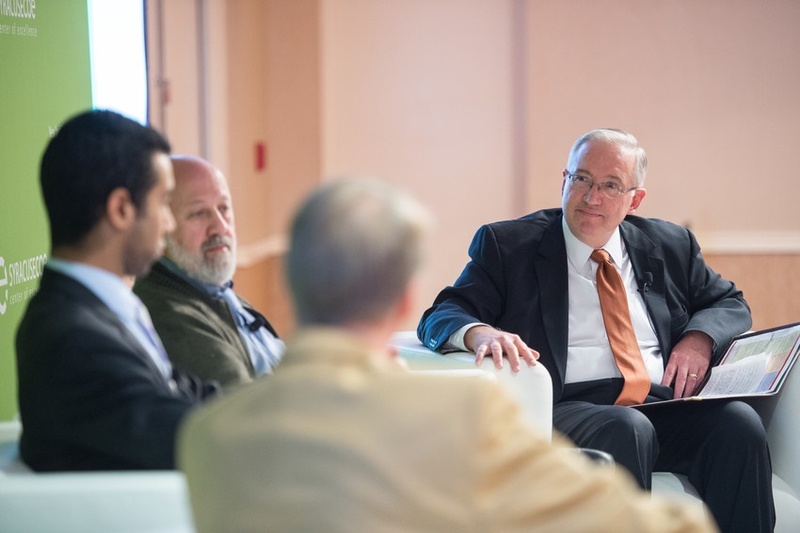 The panel included Chioke Harris of the U.S. Department of Energy, Chris Gorman of National Grid, and Taitem’s Ian Shapiro. Ian’s response was that the development of reliable and high-efficiency LED lighting and the drop in price of photovoltaic energy are two great examples of developments of the last 30 years. He also mentioned Aeroseal duct sealing, a development of a national lab that successfully made it to market. And imagine in 30 years if an energy crew pulls up to a building, does an energy audit in a couple hours, reviews and chooses a scope of energy improvements with the owner the same morning, and moves right into improvements in the afternoon, completing a retrofit within a couple days, almost like washing a building’s windows. 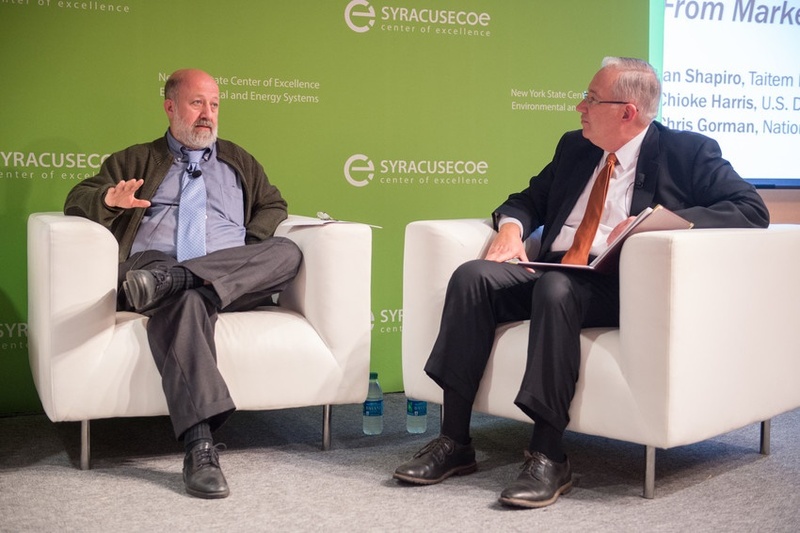 The panel moderator was Ed Bogucz, Executive Director of Syracuse CoE. While media outlets are focusing on the Presidential campaigns, you should also be aware of upcoming legislative action that will impact your friends, neighbors and community. The federal Solar Investment Tax Credits (ITC) are set to expire at the end of 2016. This key financial support credit will be reduced to 10% from 30% of the installed commercial system cost. The residential credit will be eliminated altogether (from 30%). We expect this would drastically reduce how many solar systems people will install in the coming years, just when Solar PV is beginning to have an impact on our fossil fuel energy use. The ITC represents an investment in our future, and has already seen hundreds of thousands of Americans choose renewable energy for their homes and businesses. Since Congress adopted the ITC in 2006, solar installation costs have dropped by 73%. Extending the tax credits beyond 2016 will help drive costs even lower, and see our energy mix continue its shift away from fossil fuels and nuclear energy and to renewable energy sources. Thirty years ago, I was designing and selling solar systems for a company in Indiana. We had a thriving business until the federal government took away the solar tax credit. Shortly after that, our company and many others across the country went out of business, stalling the momentum that had been building. Just think of how much farther ahead we would be today, if all those companies had been able to continue reducing our fossil fuel usage. Let’s not repeat that scenario! Please contact your congressperson and urge them to extend BOTH the commercial and residential Investment Tax Credits.